The art book 'Foldforming at 30', the benchmark overview of foldforming in the arts, is now available in a new full-color edition from Iceforge Press. FLORIDA, N.Y. - Nov. 25, 2014 - PRLog -- Foldforming at 30, a pictorial survey of the innovative metal-forming technique known as foldforming, has just been released in a new edition by Iceforge Press. This follows its initial debut in August as a collectors’ edition photo-grade art book. Foldforming at 30 is a survey of the evolution of foldforming in the thirty years since Charles Lewton-Brain first investigated the technique as a grad school metalsmith in the 1980’s. He went on to formalize a system so innovative that the Victoria and Albert Museum called it a new approach to the manipulation of metal, and Paul Craddock of the British Museum Research Lab referred to it as “a new approach to working metals without precedent.” In 1991, Lewton-Brain won the Rolex Award for this pioneering work. Foldforming at 30 gathers the works of many individual artists in a benchmark survey of how this innovative sheet-forming technique has evolved among sculptors, metalsmiths, and jewelers. The book’s full-color collection of current works suggests that artists who construct with foldforming techniques are moving into more sophisticated and less obvious uses of the folded forms, and demonstrates that foldforming as an artist’s technique is now being explored in related disciplines of sculpture and functional objets d’art with astonishing results. Selections for the book were gathered in a call for artists in the inaugural Lewton-Brain Foldform Competition, and include images of all winning pieces and jurors' choice selections for competition years 2012 and 2013. A total of 49 pieces are represented in brilliant color and clarity, ranging from jewelry to functional objects and sculpture. The forward was contributed by foldforming pioneer Charles Lewton-Brain, with commentary on each work by Hazel Wheaton, 2013 judge and editor of Art Jewelry magazine. Additional insights are offered by metal artist, educator, and author Cynthia Eid. 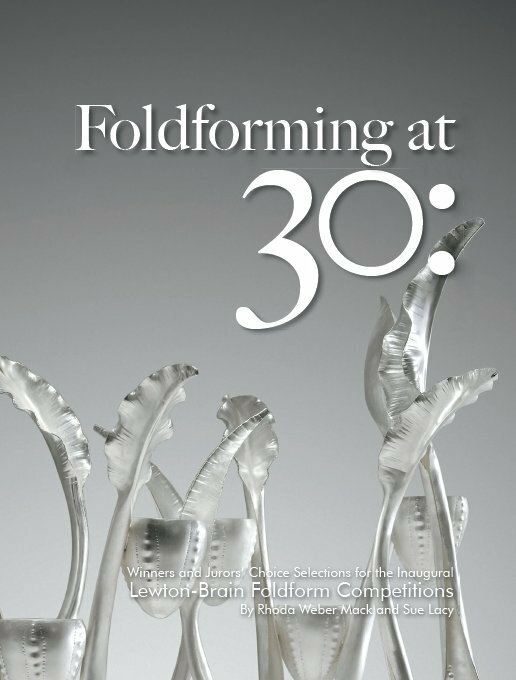 The annual overview of foldforming in the arts was launched as the Lewton-Brain Foldform Competition by the Center for Metal Arts in 2012. The next competition deadline is June 15, 2015, and will be announced online at http://www.centerformetalarts.com. The juried selection of new foldformed works will be previewed at the Friday Night Awards Dinner during Lewton-Brain's annual tour of the American northeast, and is open to the public. Information for the annual Lewton-Brain weekend event will be available on the Center for Metal Arts website.